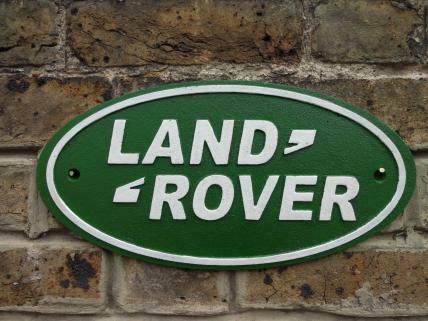 This cast iron wall plaque celebrates the famous Land Rover brand. It's oval in shape and features the green and white colour scheme that is synonymous with the British off-road vehicle manufacturer. The reproduction sign comes with pre-drilled holes, making it easy to mount on walls or fences. This vintage-style piece is very popular with automobilia enthusiasts, lending a nice touch of British motoring heritage to garages, workshops or offices.